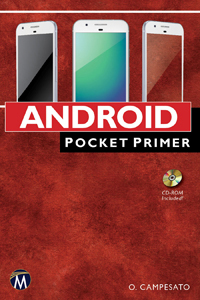 Android Pocket Primer provides an overview of the latest Android mobile features to developers who are relatively new to this platform and its new Virtual Reality (VR) features. Featuring the new Google Pixel phone, readers will learn about various "core" concepts in Android, and also gain an understanding of how to use many Android APIs. Moreover, the appendices include an extensive set of references for extending your knowledge of Android. This hands-on title includes numerous code samples throughout. The focus is to provide code for Android features (such as buttons, text fields, and media-related APIs) that are likely needed in Android applications. The use of shorter code samples allows for more Android APIs to be included in this book. If you intend to become an expert in Android, this book will provide a "stepping stone" for your journey. 1: A Quick Introduction to Android. 2: Basic UI Controls. 3: Additional UI Controls. 4: Graphics and Animation Effects. 5: User Gestures. 6: Working with Sensors and MultiMedia. 7: Data Storage and File I/O. 8: Services and Broadcast Receivers. 9: Android VR, TV, and Auto. 10: FRP and RxAndroid. Appendices. Oswald Campesato (San Francisco, CA) specializes in D3, Java, Android, and CSS3/SVG graphics. He is the author/co-author of twenty books including jQuery, CSS3, HTML5 for Mobile and Desktop Devices, and the Python Pocket Primer (Mercury Learning).